Yes, you can teach your child to read! I have been cleaning out. I want to do that summer sweep to get rid of the unnecessary school materials and get ready for the next, which is right around the corner. While going through some cabinets, I found books that my two oldest daughters, now 19 and 17, had written when they were young. I thought I would share them with you to give you some simple ideas about how to make books with your children. Writing a book with a child can seem like a daunting task, but it is really quite simple. Here’s a look…. 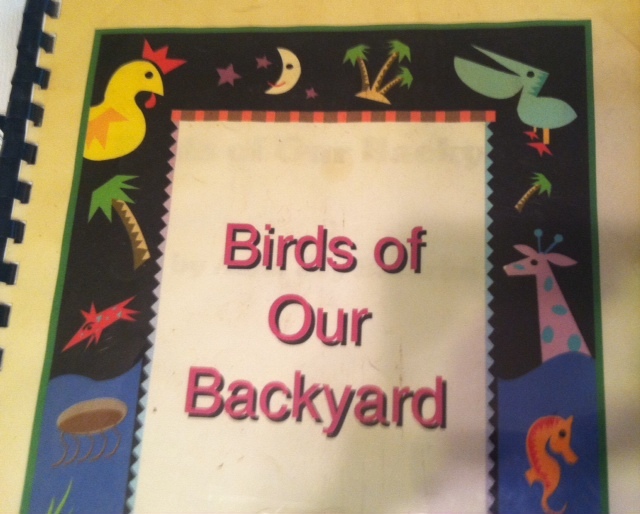 This book, Birds of Our Backyard, was written by my oldest daughter when she was about 4 or 5. Yes, it’s quite impossible for a young child to do such a thing on their own, but not when you do the writing! It’s a technique called dictation. Dictation is one of my favorite teaching methods. The skills learned through dictation are largely determined by who is doing the dictating and who is doing the writing. A young child can tell a story as someone writes it down. 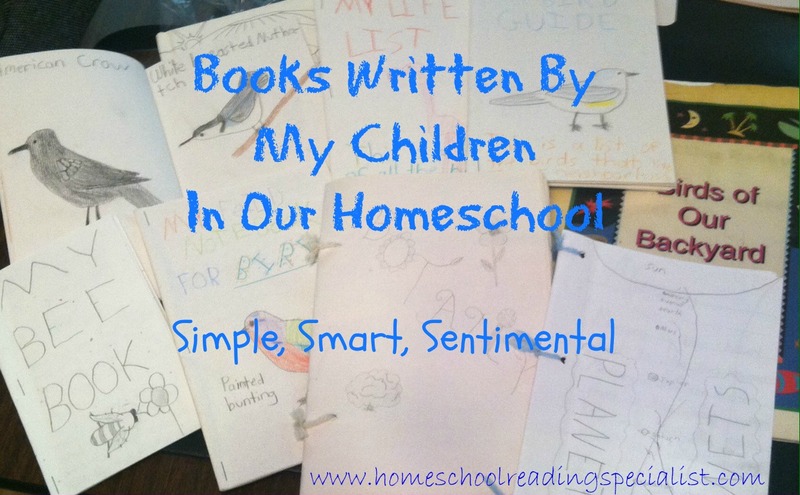 It is a great way to begin cultivating a love for writing in your child. Here is a very simple book ~ Just fold paper and staple. 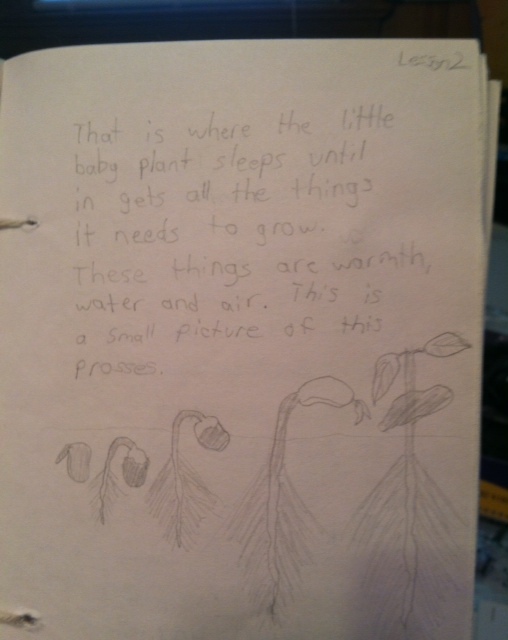 This is a picture book my now 17 year-old did when she was about eight. 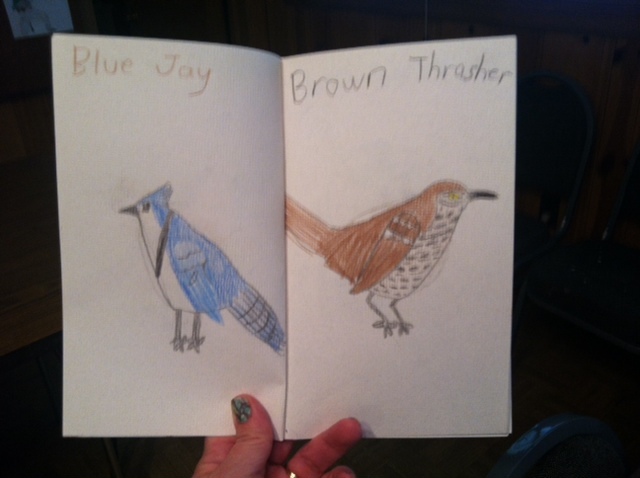 When SG went through Apologia’s Young Explorer’s Series, she made these books…. This book is simply made by hole-punching paper and tying it together with yarn. 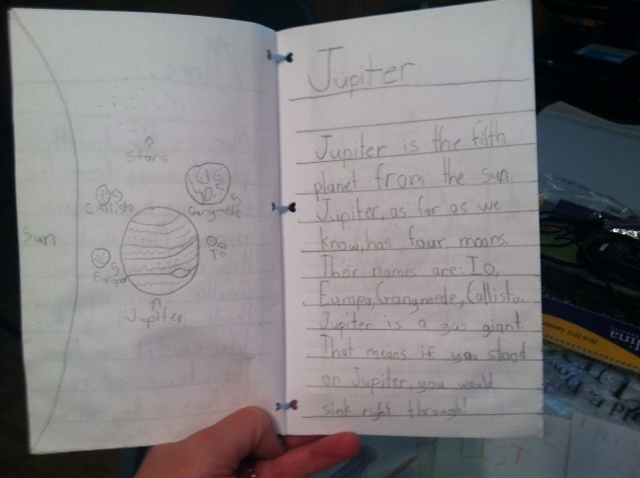 This book is about the planets in our solar system. Each planet was given two pages ~ one was a picture; the other was for facts about the planet. This book is about bees. It was written to show all the jobs bees have in a hive. 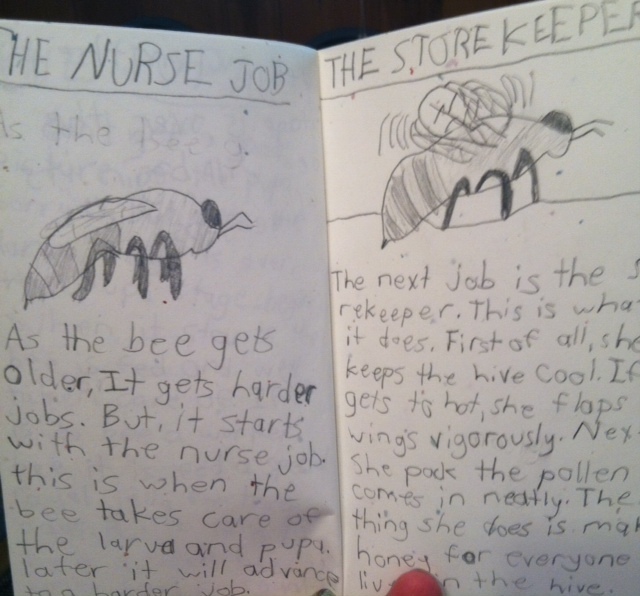 There is one bee “job description” per page. 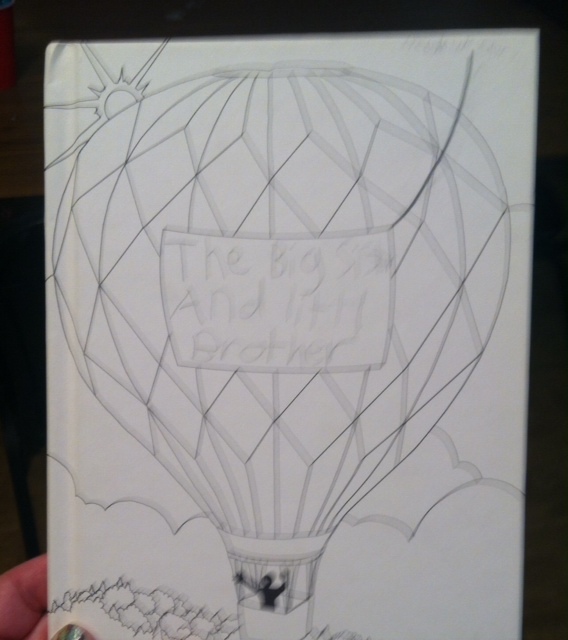 I end with my favorite book, The Big Sister and Little Brother. I don’t recall ever seeing this book, so it was so much fun to sit down and read it. I called everyone together and read it out loud. It was SG’s account of something that had happened with her brother and sister. It was rich with dialogue and description. Everyone loved it. It now has a very important spot on our bookshelf and will be selected during quiet reading time, I’m sure. As you can tell, this book is not like the others. It is a hardbound book with a black and white illustrated cover. I get these books from Miller Pads and Paper. They have a wide variety of hardbound, blank books. What are you waiting for? Fold some paper, staple, write a book! 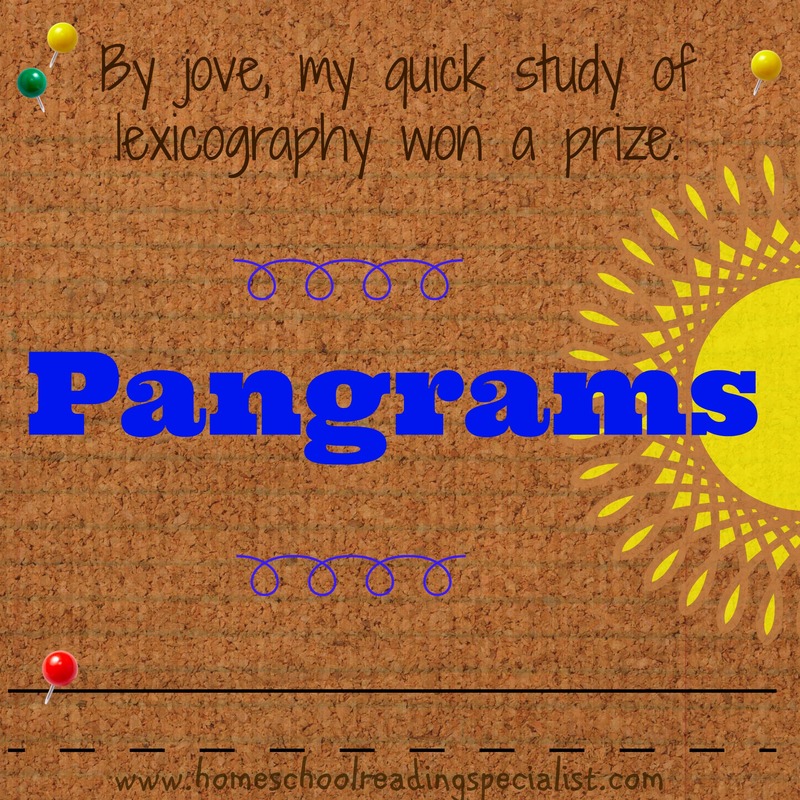 Writing on Wednesday ~ Pangrams! Pangrams are sentences that contain all the letters of the alphabet. Pangrams are great for handwriting practice and even provide fun impromptu lessons for vocabulary or grammar. Pangrams provide perfect penmanship practice because they contain every letter of the alphabet. Write the sentence once then go back and write the sentence in capital letters. In two short sentences children can practice every upper and lowercase letter of the alphabet! Pangrams are a fun way to learn vocabulary and grammar. Look at number three below. I did not know the word “jackdaw.” In my first read-through of this sentence, I took the word to be “a” thing (one thing). Then I realized if it were just one thing, the subject and verb didn’t agree. This prompted me to look up the word “jackdaw.” Ah-ha! A jackdaw is a bird. Now the sentence makes sense. ~ Below, I have a list of pangrams for you. I didn’t include sentences that were hard to comprehend. These can truly try your grammar skills. Do a google search of “pangrams” to find some non-sensical pangrams for a real grammar challenge. B, C, F, G, H, I, J, K, M, O, P, Q, U, V, W, X, Y, and Z are letters. Jackdaws love my sphinx of black quartz. The five boxing wizards jumped quickly. My grandfather picks up quartz and valuable onyx jewels. A large fawn jumped quickly over white zinc boxes. Five or six big jet planes zoomed quickly by the tower. The jay, pig, fox, zebra and my wolves quack! Six crazy kings vowed to abolish my quite pitiful jousts. Jack amazed a few girls by dropping the antique onyx vase! Jay visited back home and gazed upon a brown fox and quail. May Jo equal the fine record by solving six puzzles a week? Fred specialized in the job of making very quaint wax toys. Freight to me sixty dozen quart jars and twelve black pans. The job of waxing linoleum frequently peeves chintzy kids. By jove, my quick study of lexicography won a prize. Just keep examining every low bid quoted for zinc etchings. All questions asked by five watch experts amazed the judge. Watch “Jeopardy!”, Alex Trebek’s fun TV quiz game. Get a printable copy of this list Pangrams. I am a big fan of Montessori’s approach to learning, so I was very excited when I found out that Heather at Golden Reflections Blog was offering this digital download of her writing program for young children at HALF PRICE (2.49) through July 6. Heather is an occupational therapist homeschool mom, so she has expertise in knowing the best techniques for teach young children to write. Check out her 6-week curriculum here! 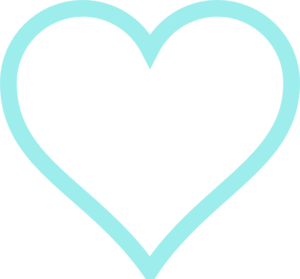 Writing On Wednesday is a post from www.homeschoolreadingspecialist. Write the date in the blue box at the top. 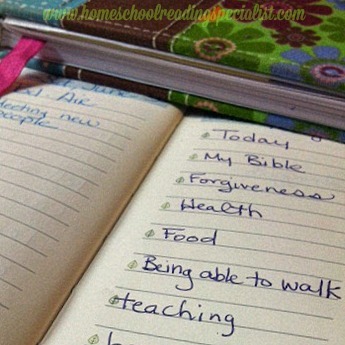 Jot a list of things you are thankful for from that day. 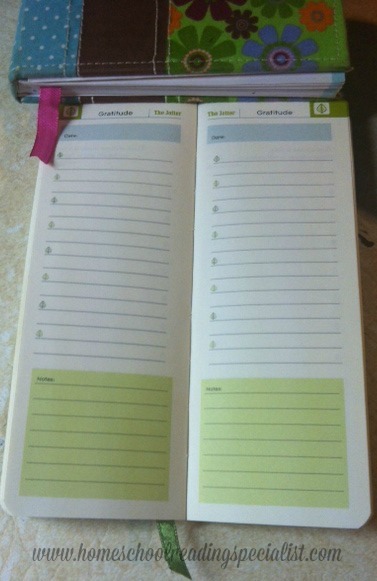 At the bottom there is a green box in case you want to jot down some notes about the day. It’s that easy. It is very refreshing to look back through my pages and count my blessings. Gratefulness is learned. Children can begin to cultivate the character trait of gratefulness by writing down the things they are thankful for each day. They can be taught to look beyond their toys and games and see the many things that can be easily taken for granted. Once I was challenged to consider this question: What if you woke up in the morning and the only things you had were the things you gave thanks for the day before? Wow! That shifts the perspective, doesn’t it? If you have trouble counting your blessings, think about that. Don’t limit yourself to things you can see; look at the unseen gifts ~ peace, love, joy, faith, etc. 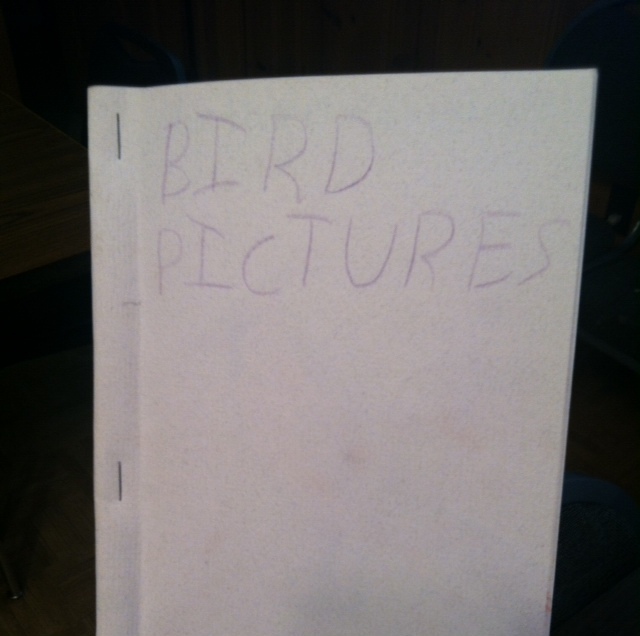 I think a jotter is a great tool for a child to use to write meaningfully in an easy, simple way. They begin to learn how important and powerful written words can be, touching the heart, creating memories, and developing character. 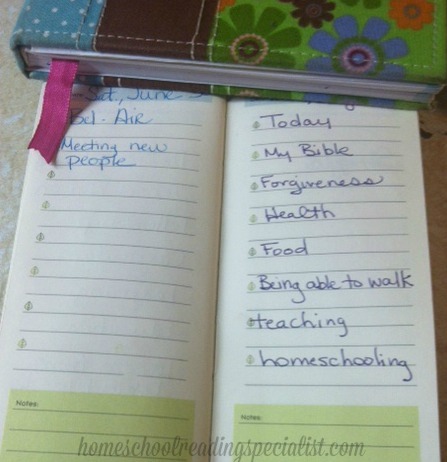 It’s a great way to introduce them to journaling too. 1) Give your child a jotter and show them how to use it. Have a time each day, like after dinner or just before bed or first thing in the morning, to write in the jotter. Let them see you write in your jotter too. 2) Have a jotter for each child and regularly write down things about them for which you are grateful ~ your kindness, trimming the bushes, cooking dinner, your service to our neighbors, your music ~ can you imagine how powerfully affirming that would be to a child? Words have power and can be used to make an incredible impact on the heart of a child. What a treasure to have mom or dad’s affirmations written down as a keepsake for the future. Your words can live on… if they are written down.